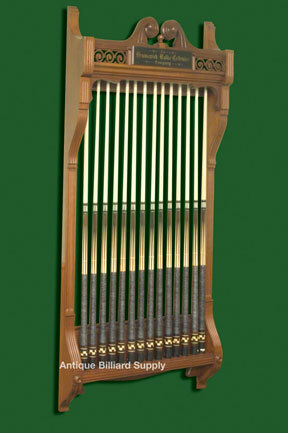 #5-03 Fabulous early Brunswick antique pool cue rack in solid cherry wood. Perhaps one of a kind. Extensive ornate cutouts and carvings on crown. Original Brunswick-Balke-Collender name panel is not retouched. Holds 14 cues.